Dr. John is currently in Nairobi taking a well-deserved vacation with his wife, Victoria and their son, Marshall. Victoria is a registered nurse and plans to join Dr. John and the rest of the staff at the Malek Christian Hospital soon. Please welcome Victoria and Marshall into our SSAM family. Dr. John with his wife Victoria and son, Marshall. Angelo recently suffered what appeared as “stroke like symptoms” as a result of untreated high blood pressure. SSAM sent money to have Angelo flown to Nairobi in order to receive proper medical treatment. Angelo is a valuable part of SSAM and is principal for the Aweil Bible College. This is a report from Dr. John…. We have been to the hospital on a daily basis since and has received several medications and tests by the neurology specialist at Coptic Hospital Nairobi. He is also receiving physiotherapy on a daily basis and is showing bit by bit improvement on the affected side. Angelo cannot use the left side of the mouth for eating because the muscles were paralyzed. His blood pressure is now under control and nerve stimulation therapy is ongoing on a daily basis. More test results for final diagnosis by the neurologist will be communicated on the next doctor appointment on October 29, 2018. Greetings to you in the name of Almighty God. To answer your question, I do not want to come and take over the leadership of the SSAM. I will be happy to give advice and encourage our pastors to put their efforts in the village churches to have a strong base in their towns. I believe that the Church needs my support more than before. The opportunity that I had working in the government opened doors for me to know that very important people gave their life to Jesus Christ. I believe that God had a plan of make me Governor of Aweil state so that I would be able share a message of peace with those who never thought one day they would give their life to our Jesus Christ. Dr John is doing well with SSAM administration in South Sudan and I pray that he continues with the work that he is doing. I believe all the boards of directors of SSAM in South Sudan are happy with work that he has been doing for SSAM. South Sudan Churches of Christ are among the most respected institutions in South Sudan because the message of the Christ that has been delivered to them by SSCOC. SSAM has played keys roles before and after the independence of South Sudan. The Church of Christ has changed many people’s lives as they have turned to Christ through baptism. The Church of Christ has played a vital role in reconciliation and peace efforts for many years. The Church of Christ is working hard to promote reconciliation at local level and expanding the Church of Christ to other areas. I believe that God has big plans for the people of Aweil which is why God brought me to be the Governor of Aweil State. I was able to bring for the first time the message of Christ to my cabinet by attending church services every Sunday. I was not stopped delivering the gospel of Christ to his people in Aweil State, when l was appointed to the post of Governorship of Aweil. I am not feeling well at all. I have high blood pressure and have had pain in my left leg since January of this year. I pray for funds so that I can go for further medical check-up to Nairobi or Khartoum. Angelo will be completely healed and able return home soon. SSAM Board member, Herb Oxenrider battling cancer. Dr. John’s wife and son will be able to join him soon in Malek. ABC students as they complete the last couple month of classes before graduation January 2019. The joy I have had this year in partnering with SSAM has been overwhelming. To see firsthand the impact that is being made in this nation through the Bible College, Evangelists, and Medical Ministry was amazing. I’m not sure how much it costs to change a kid’s life here, but it is evident the Bible College student’s lives are being changed. I watched as students were given an opportunity that most children in this region will never be afforded. Their growth, desire to learn, and the joy in their hearts were contagious. One of my most memorable days was when we traveled out past where the road ends and saw the work the evangelists had been doing preparing hearts and planting churches through SSAM. The oversight of Dr. John along with his medical care as a physician was inspiring. I watched as the evangelists led the churches and Dr. John and his team provided medical care to those in need until everyone had been helped. I must say, the inspiring work of SSAM was evident through the leadership that is in place at Malek. After our long trip back of medical mission work that day a young girl had fainted and was dehydrated near Malek. I know Dr John was exhausted from the trip but he smiled and gladly went to see about her care. I went with Dr. John and watched as he administered fluids and medication to a young girl that was my daughter's age. 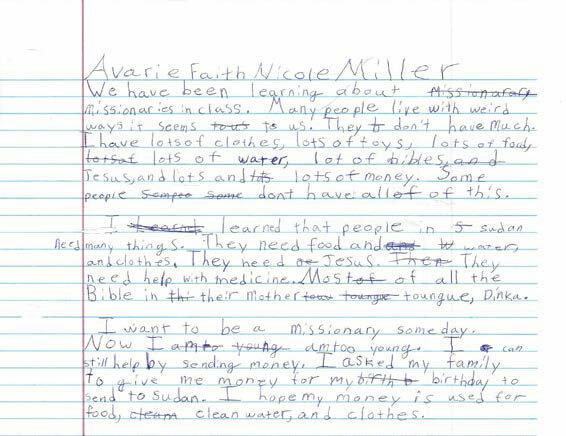 It brought me to tears of joy and I will never forget thinking that this girl’s life was just saved, and who knows, maybe she too will be one of the next students of ABC that will help turn South Sudan closer to Jesus and cause His light to shine brighter in Malek through her life. Long time board member, Herb Oxenrider of Gresham has been recently diagnosed with cancer. Please remember Herb and his family in your prayers. If you would like to send a card of encouragement to him his address is 1054 SE Acacia Place, Gresham OR 97080. Does it ever seem to you that there is “too much month at the end of the money”? Sometimes this is caused by overspending on our part, or a “once in a blue moon” expenditure that we have been anticipating. Other times it is caused by things beyond our control… a medical emergency, a home repair or other crisis. Our evangelists and pastors in South Sudan have never received a “cost of living allowance”. This is because we do not want them to become overly dependent on outside money. The reality of living in a war zone is that everything is beyond their control. We sent extra money last month and two times earlier in the year to get the men and their families through the rainy season and into harvest time. There was a peace treaty signed between the warring tribal factions and hopefully this will open things up and ease the rampant inflation. If you are able to help, extra funds would be most helpful and appreciated at this time. We are so grateful for all our mission partners and your generous faithful giving. May God richly bless you. JUBA, Aug. 15 (Xinhua) -- South Sudanese President Salva Kiir on Wednesday said the peace agreement signed with rebels marks the end of over four years of conflict as it brings members of the various warring factions into one national army during the start of the transitional period. "My take is that the best agreement is the one on the security arrangement not only because it was straight forward but it provided that the transitional period will start with a neutral force," Kiir told leaders from the ruling Sudan People's Liberation Movement (SPLM) in Juba . He said the army will recruit from the 64 ethnic groups in South Sudan that will give the Sudan People's Liberation Army (SPLA) the desired national outlook and character. President Kiir signed the peace agreement on Aug. 5 in Khartoum with Riek Machar, leader of the main rebel group SPLM/A-IO and other opposition groups which was mediated by the Sudanese President Omar al-Bashir under the auspices of the East African bloc IGAD. According to the peace deal, civilians will be disarmed throughout South Sudan which the president said are crucial for security to improve, since the civil population is awash with illegal guns that aid the rampant cattle raiding and revenge killings through community clashes that have greatly contributed to loss of lives and property. "As I said in Khartoum this peace is the most important for me and I reiterate that it marks the end of war in South Sudan forever, but that can never happen if our people continue forming militia groups which are based on ethnicity and regions," said Kiir. This time around there were no external pressures seen forcing President General Salva Kiir, and Dr. Riak Machar the opposition leader to go and sign the peace deals and the process. They have decided on their own and request the neighboring leaders (president of Uganda, Sudan, Kenya and Ethiopia) to witness their peace deal. This particular peace deal is taken with much hope that with this reconciliation process and healing through forgiveness, South Sudan will bring peace home. The prayers are that the peace must return to South Sudan so that the internally displaced people can return and rebuild their home. The wars have caused enough catastrophic conditions ranging from ethnic violence, starvation, disease outbreaks, displacement, poor living conditions lack of schools, hospitals, clean drinking water, food, and above all Jesus. We need peace so that our evangelists can move freely from town to town giving out the living Word so that the children of God may hear and believe so that we can become God fearing and the strongest nation possible. Though there is public mistrust and doubt the two leaders have vowed they will not allow anyone to oppose this peace deal that is centered on compromised agreements. We are praying that this process come to fruitions. The people of South Sudan are praying for a permanent peace process. With the will our Almighty God – this is achievable. ABC students as they complete the last couple months of classes before graduation in January 2019.
gradutation. Please pray for those who plan to go and the proper funding will be available. More on our trip in future newsletters. Peace will become a reality to the citizens of South Sudan. Today (July 15th), we were at Dokul Church of Christ, a place you may recall that we received funds from Cornerstone Church in Rome, GA so the congregation could repair their church building. The Christian have put invaluable efforts this last month. The congregation turned up in numbers to commemorate the Thanksgiving Sunday that was meant to give thanks back to God, the SSAM leadership and the American people for the support to the local church. However, the funds weren't enough to cover everything like sitting benches inside the building the congregation came with their chairs from home to use during sermons. Many people (children and adults) attended today's sermons and it was blessing to have the good news passed to them with encouragement so that they may work for the development of the church and bring many people to Christ. The local radio station sent a representative. Most of our evangelists and pastors were interviewed and asked to send a message of peace to the local population around Aweil. Local Government representatives and other church leaders were with us today and we were able to share the gospel with them. We have no words to describe how thankful we are to SSAM and to Jody and the congregation in Rome, GA in particular. Attached are a few of the photos captured today at Dokul Church of Christ. We have begun a busy year like never before. If we count our blessings we will be more than grateful but so many blessings with so little resources have been given to us by our faithful supporters with prayers in the name of our Lord Jesus Christ. The relief food and medical aid items purchased were finally recognized for exemption by the national government of South Sudan. If the medicine was to be taxed as normal goods for trading it would have cost about $6,000 to pass through the South Sudan – Uganda Border to Aweil. For now, this amount is exempted to $0.0. The medicine will cover June till August. The food will be for ABC and the poor who are dependent on the Church at Malek and Apada in Aweil. So far, the 20-foot container is coming to Aweil from Nairobi. We were able to secure food and medicine items worth about $55,000 from Njimia Pharmaceuticals Ltd in Nairobi, one of the wholesalers and manufacturing firms in the Kenya Market. Njimia has pledged to work hand in hand with South Sudan African Mission so they will continue to deliver medicine and food on a quarterly basis as long as the roads are not blocked by water or insecurity. We have assessed the safety measures and we were convinced that the truck will come through. What we did not anticipate were the steps involved legally to have foods and medicine imported from outside the country via road. More work was demanded from myself but because of your prayers for the poor the clearances were concluded. I hope that the requirements for the next consignment will be just to follow the same steps with the created files reflecting our purpose and mission in every office that is concerned with such operation. Familiarizing SSAM with the government institutions will allow us in the future to transport large amounts of support via Mombasa should we have materials donated from abroad without heavy taxes attached to items like medical materials and Bibles. Ezra Atak and Luka Goch are saying in reports yesterday the situation is getting worse with the people in Aweil. They say that the living expenses they are entitled to receive will not be enough for them over this wet season. Every family is expected to plant crops. This means that large farms need to be farmed for enough food until the harvest. Governor Yournew is trying his best to deliver any available service to the people of Aweil with love of God and with an intolerable fight against endemic corruption in the government. In our discussion last month with the governor he asked me if Steve and his team could spend more time next time he visits South Sudan so that we can organize leadership courses for few days or even a week where the focus will be the good governances, fighting against corruption and how the leaders can relate government to God. We continue to pray and offer support to Governor Yournew anytime he may need it. Receive my best and warm greetings in Jesus Christ’s name. Wish you all well and healthy in the Lord. I would like to take this opportunity to extend my gratitude in respond to the recent letter I’ve received from you concerning my welfare in the State Government of Aweil State. First of all, I would like to thank and appreciate South Sudan African Mission. If it was not for their initiative and support, I would have not been trusted to lead this great state of Aweil. Because you have laid a very strong foundation, the people of South Sudan in general and people of Aweil State would have not chosen me to be their leader (Governor). I’ve never forgotten the honor you have given me since 1988 until the day I was appointed as Governor of Aweil State your honor has paved the way for my current leadership which was bestowed on me by H.E. General Salva Kiir Mayardit – President of the Republic of South Sudan and the People of Aweil State. Through your prayers for Aweil people in particular and South Sudan in general we have made a greater impact on our daily lives which is reflected in the current peace we have in Aweil State with its sisterly States of Aweil East and Lol. Dr. John and the in-country Board of Directors as they lead the mission in South Sudan. Governor Yournew. Wisdom as he governs Aweil State. Aweil Bible College students as they continue their studies and look forward to graduation in January 2019. Malith and Achuil are passing their love and greetings to the Christians in USA. They are engaged in classes and activities in the missionary run school in Wau. They say now they understand why they were subjected to farming, hospital cleaning and caring of the compound while they were in Malek. They said this is encouraging them to continue their commitment to the mission work. They are full of enthusiasm to work for the mission should they qualify as registered nurses in the country. “We are coming to help our people in Malek Christian Hospital. We will make sure that we show God’s love by developing Malek Christian Hospital into a national hospital that will treat children and mothers with a high quality of care. We will stand behind Dr. John and everyone else involved in this so that people see the glory of our Lord Jesus Christ”. These humble evangelists come to treat patients at Malek whenever they are given a two week or 1-month holiday. We were able to visit the Chidamoyo Christian Hospital near Chidamoyo, Zimbabwe. The hospital serves a large rural area and had just celebrated their 50th anniversary. It is because of their influence, Fanny was led to the Lord. The last day before boarding our plane for home, we stopped by the Zimbabwe Christian College which for me was one of the highlights of our trip. Three of our first SSAM students, Yournew, Kuac and Michael (now deceased) attended college there in the early 1990’s. Yournew graduated in 1993. Dad and Mom (Paul and Marilyn Douglass) spent a lot of time at the college coaching the young men with their English and classes. The President, Sidyne Mavodza said that Yournew was his best friend while he attending college there. 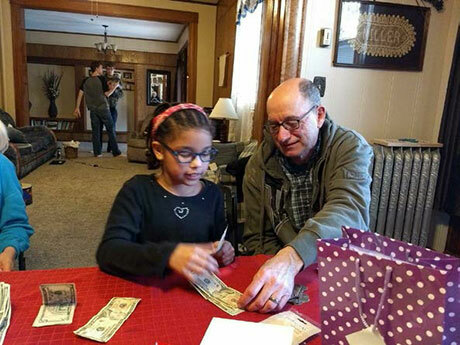 Avarie recently turned 9 years old and for her birthday she asked her family to contribute money to be sent to South Sudan instead of buying her toys or other gifts. With her mother and father’s permission, (Les and Natasha Miller of Fredonia, KS) following is the letter she sent with her $160! Oh, to be like a young person who has a heart for missions! Over a year ago I was asked by my good friend, Martha Nyamutora and her husband, Fanny to come to Zimbabwe to speak on a Ladies Conference in April 2018. I first met Fanny and Martha when they came to Rochester, MN to attend Crossroads College with their two young boys, Simba and Mark. (Son #3, Joshua was born while they were in Rochester). Because Dad and Mom (Paul and Marilyn Douglass) had known Fanny and Martha while they were in Zimbabwe and some of the young men were going to Zimbabwe Bible College there, Dad suggested I “get to know them”. Little did I know this would become a lasting, enduring friendship! I remember taking Martha to a Ladies Conference in Rochester and sitting with her as she experienced a U.S. ladies conference first hand. Now I am going to Zimbabwe and will be experiencing a Ladies Conference in their country. In addition to myself, there are three other ladies going. Marette Jorgenson and Michelle Larson from Rochester, MN and Sharon Werner from Lyons, Colorado. The Conference is April 26-29 and I will be one of the speakers. The topic I have been given is “Experiencing the Power of Prayer”. In addition to the Ladies Conference, we will be helping with a Holiday Bible School for children, April 18-22 and visiting the Chidamoyo Christian Hospital. Please keep our group in your prayers. We leave April 15th from Minneapolis and will return on May 2nd. I will be leaving Portland April 11th and will be gone three weeks since I will be attending a IDES Board of Directors meeting prior to our trip. I will do my best to get receipts out and correspondence answered in a timely manner when I return. 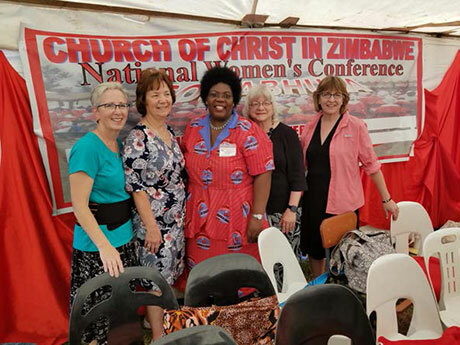 Bev and the others as they travel to Zimbabwe April 15 – May 2. Dr. John and the in country Board of Directors as they lead the mission. Yournew as he governs Aweil State. Wells being drilled in Ezra and Joseph’s villages to be completed. The teachers and students at the Aweil Bible College. We are sending you greetings in Jesus’ name. May the grace of our Lord Jesus Christ be with you. Yesterday was a big day at Malek. Baptisms were conducted along the river Kueng and below is the report. We have a new born-again group in Christ today, Sunday, February 18, 2018, at Malek Church of Christ. 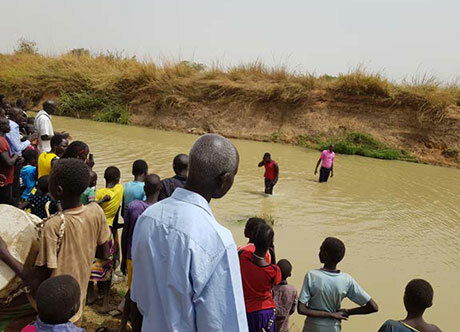 Thirteen members of the 23 men and women baptized today are students evangelists at Aweil Bible College. The students at ABC came from various churches but have now learned and believed that immersion under water is the true symbol of baptism. Today they confessed Christ and were baptized. The other ten men and women were moved by the Word and have now become Christians. As evangelists of Malek Church of Christ, we are now doing our work and duties in Christ as scripture says in the book of Matthew 28:16-20. We are requesting prayers for faith, spiritual growth, wisdom and health in Christ for the new members of the church. Following is a list of our newly born-again students and converts so you may pray for them by name. Thank you for your support and prayers for growth to Malek Church of Christ. 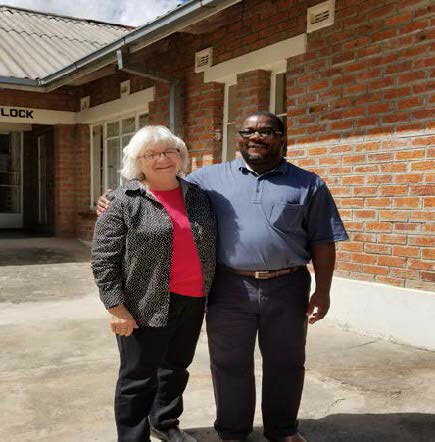 In addition to my work with South Sudan African Mission, I am partnering with John Hendee of Team Expansion and Hope International University to train African leaders in relational evangelism. We are using a gospel presentation that John developed many years ago called “It’s All About Relationships” (formerly A Peace Treaty With God). One stop on a recent three-week trip to Ethiopia, Kenya and Nigeria was in Nairobi. We brought Dr. John down from Aweil for a few days to accomplish some important tasks. We met with David Tonui, Principal of Great Commission Bible College and his staff. Most of our key leaders in South Sudan African Mission received their training at Great Commission. David and his team gave us refreshed copies of the entire curriculum and permission to use it, as well as agreeing to send two of their staff up to Malek to certify our teachers so that our certificates of completion can be endorsed by Great Commission Bible College and ABC can operate as a satellite campus. This will give our graduates more credibility in the eyes of their countrymen and the rest of the African community of nations. We met with a Kenyan bank to try to make it possible to pay our medicine suppliers from a Kenyan account because of the high costs involved with South Sudanese Banks and the currency exchange. We are still working on this one! Please pray that we find a workable solution. Funds going into South Sudan are on a U.S. government watch list and are heavily monitored. Because of this and other factors, the banks impose fees and give a very low exchange rate. Our suppliers prefer to be paid in U.S. dollars. I was also able to take Dr. John to visit a medical clinic on the outskirts of Nairobi built by a group from Boise, Idaho. He was able to tour the clinic and meet for an extended time with the clinic staff and get some leads on reduced medicine costs, as well as “best practices”. One errand was pretty simple but should have a profound effect on the students at Aweil Bible College. We were able to purchase 30 identical NIV Bibles so that all the students are using the same translation in classes. When I visited in November I found a variety of paraphrases and translations, many in very poor condition. Differences in translation led to confusion on the part of both teachers and students! Some of the students had to share Bibles. Now everyone has his or her own copy- all with the same translation and matching page numbers. It was a joy to introduce Dr. John to John Hendee and other colleagues and see their respect for him, and listen with pride and gratitude as he shared his life story and testimony. We are blessed to have such a humble, dedicated, godly servant in the SSAM ministry! We are discussing the possibility of doing relational evangelism training in South Sudan. Dr. John stopped in Juba on his way home and met with Santino, Peter Gatdet and Paulino to witness the good work that is being done at Juba Church of Christ. 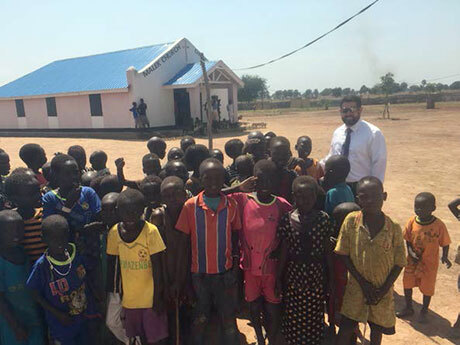 While he was in Juba he arranged for the purchase, delivery and installation of solar panels and electrical and internet equipment for the offices in Aweil. All together, it made a profitable trip! We have proposed that we get a larger parcel of land at Apada which is on the outskirts of Aweil Town. We will support them with local materials to put up their shelter for worship. Angelo and Joseph will meet with them soon. We have applied to the Ministry of Land of Aweil town to allocate a plot for the Apada church so that we can secure it with a local shelter in the near future. The majority of the the people living in the Apada area are refugees from Khartoum. 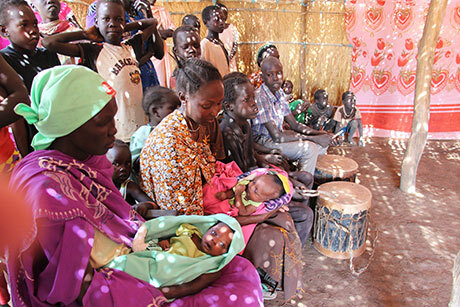 A mother with her recently born twins who are part of the Apada church. Paulino’s wife has been ill and in the hospital in Uganda. Wisdom for Dr. John and the team as they lead the mission in South Sudan. Yournew, as he governs Aweil State. Without going into detail, banking issues to be resolved for funds going into South Sudan. SSAM Board of Directors traveling to Gresham for a board meeting, March 5th. SSAM has received funds to drill two wells in the Aweil area. The well drilling companies have been reluctant to travel into South Sudan in the past because of the ongoing war and treacherous road conditions. However, the well drilling rigs are currently drilling in the Aweil area! Thank you to our faithful donors for the additional funds. The funds for one well came from a Mother and Daughter in California and the other was combined funds from Faith Christian Community in Anchcorage and the Christian Church in St. Helens, OR. One is proposed to be drilled is in a very far away village where Jody and Steve went. The place is called Mangartong Adhan village where the church of Christ is led by Ezra and his team. The other one is far from Malek in the village where Joseph was born. They have established a new church there where the area is very populated. The lack of clean water can be seen on the faces of elderly and the children. We are extending compassion to these people in these two locations. You can google TED talks “No Condition is Permanent” and watch it if you care to do so. So far, I believe in "No Condition is Permanent". When I was watching him narrate story of "Musu" it is as if it was my story. After high school in 2005, I won a sponsorship to be trained by Taarfund Organisation (a disaster management organization founded in UK). The training was for 9 months within Sudan at Upper Nile Region. I graduated as a community health worker and immediately became in charge at a primary healthcare facility called Panthou PHCC. Together with my team, we served an area with one million people. That's when my title of being a doctor began. Lack of hope from the dying and low level of my skills to save more lives from disease complications made me dream to further my studies at the University in Uganda. Indeed, I can say that "No Conditions are Permanent”. Mind you that two to five of more than hundreds of boys have not reached the level of community health worker or college. This makes me one of the blessed among people of my path. I have just like any other child in a war-torn country like South Sudan experienced pains from hunger, illness, loss of love ones to an enemy, slept on the road side or inside dark bushes and so on and so forth, and at times permanently displaced by Janjaweed Nomad Arabs soldiers who used to raid kids and cattle around Aweil area. This video just brought into my mind all those memories of my way up to day. "No conditions are permanent". At times, I was hopeless with no dreams to connect with the other side of the world. I was amazed watching this. I repeated the video three more times before I wrote this because I couldn't believe that I share the exact path of pains and changes with millions other people around the world. God bless you. In Christ, John. AS WE BEGIN OUR 30th YEAR…. I was reminded recently of the value not only of what we do and why we do it, but how and with whom we do it. I contacted a charitable organization with the stated goal of eradicating malaria. I told them about South Sudan African Mission and the hospital and mobile medical clinic. I was told, “We don’t work in nations that have active conflict going on. It is too dangerous for our personnel.” Having just returned from South Sudan, I can understand that, but millions of people in South Sudan don’t have the ability to leave until the conflict is over, and their need for medicine and food doesn’t wait either! SSAM wisely decided years ago that we would not have Americans live in South Sudan, not so much because of danger, but because we do not want to create an unhealthy dependency on Americans or plant the subtle idea that we know better and can do ministry better than they. We don’t and we can’t! Spiritually and economically, it makes much more sense to rely completely on indigenous workers. It would cost more than our entire budget for all of our personnel in South Sudan to send and support one American family! It also would plant the idea that we somehow are better or smarter than they. We have local pastors and teachers teaching the Bible College classes. We have local folks trained to work in the hospital. All of our preachers and leaders are Sudanese. While foreign workers and their organizations pack up and go home, our partners in ministry are “doubling down” opening new churches and planning for the future. 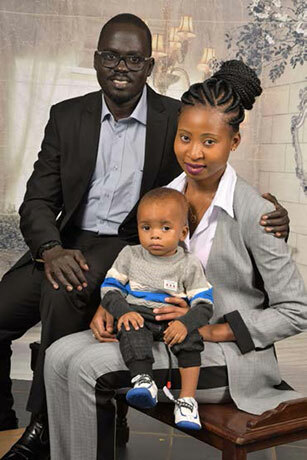 With Yournew serving as governor, we asked Dr. John, a young man from Aweil to lead the mission with the advice and counsel of a local board of directors. Their task is to pray, listen to the Lord and each other and arrive at consensus through the leading of the Holy Spirit regarding decisions for the mission. Ezra, Joseph, Angelo and John recently spent several days together discussing the future and preparing a budget for the first third of 2018. I am greatly impressed and encouraged with their proposals. Please pray for these men and all the others who work together to spread the gospel in South Sudan. Thank you for your generous support of this ministry. As we link arms across the oceans, may God be glorified! May the glory of our Lord Jesus Christ be upon you and your families. We give thanks to the Almighty God that we are doing well in Christ and that we are just about to see the New Year. May the New Year come with peace and prosperity to all of us. As a fruit of having Steve and Jody’s visitation to the team in Aweil the early days of November, the team in Aweil feel encouraged, blessed and confident to take the mission to another level. With an aim to expand the body of Christ in South Sudan, the leadership in Aweil in particular and that of South Sudan has agreed to form a body to further the gospel of Christ nationwide. To do this, we realized we need to be united and have trust and love of our Lord Jesus Christ. We formed a trustworthy body that prayed for the Holy Spirit to guide throughout the journey to expand the gospel to South Sudanese people and beyond the borders. In-Country South Sudan African Mission Board will include: Dr. John Diing – Lead person on mission affairs, Angelo Atak - Advisor on ABC operations, Joseph Wel - Advisor on Church Planting, Ezra Lual – Advisor on Church Operations. The In-Country Board held its first meeting Dec. 4-7 at the Malek Mission Compound to decide on plans for the year 2018 with a strong focus on church growth and development in South Sudan. Financial capability of the SSAM team in Aweil. Projects that support churches and church planting in Aweil area (to include churches in Upper Nile if peace return to Bentiu and Fangak where Peter and Santino stay). Decide on ABC development and sustainability. Decide on Malek Christian Hospital development and sustainability. Decide on Aweil office development and sustainability. 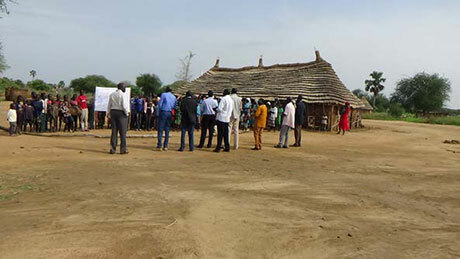 Decide on mass preaching site (gospel crusading site in Aweil) development and sustainability. Decide on when and how a site may be secured in Juba for mission activities and fellowship. Decide on leadership development and sustainability amongst pastors, hospital workers and evangelists across our local churches. Dr. John took the board members through the budget and fund allocations. With a desire to transform the team (church) and aspire to be transparent while serving Christ through mission activities, we discussed issues to do with mission financial capability and things to do with integrity to build trust and competencies among the newly formed In-Country Board Members. Meetings will be held at the Aweil SSAM Coordination Office or elsewhere within South Sudan on regular or an emergency basis. We will decide and propose projects, resolve solutions to activities that promote or hinder church growth or development locally. After discussion for four days of discussion, the Board made conclusions regarding funds, priorities, leadership roles and the annual budget for 2018. Prayers from the Christians in USA and within South Sudan so that the formation of the Board will bring trustworthiness and transparency. The faithful Christians in the USA to continue to raise financial support for the team to function and embrace salvation of Jesus Christ. 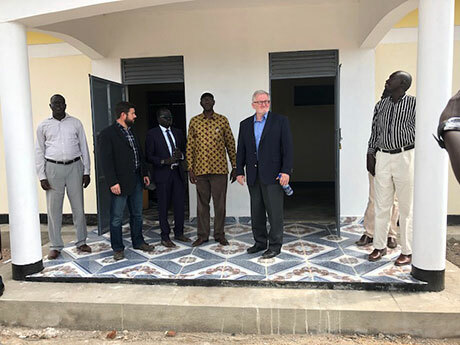 The SSAM Coordination Office in Aweil be registered and legalized to operate as a faith-based national organization which shall carry under its wings the Malek Christian Hospital, Aweil Bible College and the churches. Prayers that Yournew be with wisdom govern the people of Aweil State and to show biblical leadership to the people of South Sudan. The church in Malek wishing everyone in the USA Merry Christmas on Christmas Eve. If you contributed to the South Sudan African Mission in 2017, your statement will be mailed by January 20, 2018. Thank you for your confidence and continued support!